HAVE YOU EVER HAD one of those moments when you drive by a place from your childhood days, desperately want to get inside, but can’t? That happened to me twice on a recent visit to Redwood Falls, where my maternal grandfather lived, where I attended junior high school and where my family shopped when I was growing up. The first tour took my husband, son, mom and me past my Grandpa Bode’s house, located across the street from the hospital. Several years ago I had seen grandpa’s rambler and nearly cried at its dilapidated condition. Since then the house has been re-sided, so I felt better on this recent stop. Yet, simply viewing the exterior didn’t satisfy my yearning to get inside. Had I been alone, I may have jumped from the car, run up to the house and knocked on the door. Honestly, I really wanted to see if the bathroom walls are still tiled in pink. Caring so much about a bathroom may seem odd to most of you. But I grew up in a house without a bathroom (at least until I was about 12). I fondly recall bathing in grandpa’s pink bathroom, where my Aunt Dorothy would grab a bar of gold Dial soap, lather the soap into a washcloth and scrub and rub and scrub and rub and tickle my toes and feet until I giggled. Dial is still my favorite soap and the only brand I purchase because of those sweet, sweet memories. After pausing briefly in front of grandpa’s house, we headed toward downtown. I had no desire to see the school where I attended seventh and eighth grades. My memories of junior high are of bullying and of tears. Those are two years I would rather forget. Besides, students now attend classes in a new building and for all I know, or care, the old building could be gone. But I was interested in seeing Gilwood Haven, a columned, shuttered brick building in the downtown. I remembered, while on childhood shopping trips, going to the bathroom at Gilwood. Are you seeing a common theme here? Bathrooms. I suspect this is tied to years of indoor bathroom deprivation. As the story goes, C. O. Gilfillan donated money for Gilwood Haven after observing mothers and their children without a warm place to go into during the cold winter months while in downtown Redwood Falls. Anyway, Gilwood Haven was built specifically as a lounge for women and children to use while their husbands/fathers were doing business. City offices and a public bathroom were located on the lower level. I don’t recall really lounging at Gilwood, but I remember walking downstairs to use the bathroom in this haven. Haven—what a name, huh? 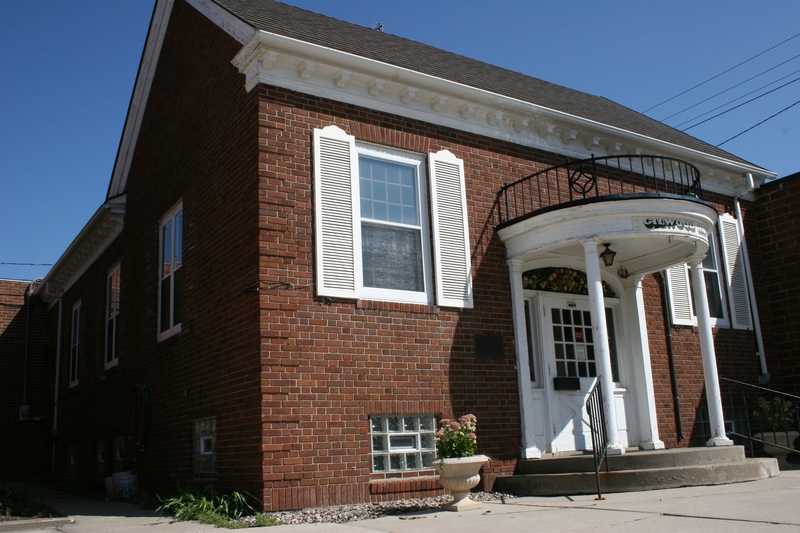 C. O. Gilfillan, a wealthy and generous community-minded landowner from nearby Paxton Township donated money for the public lounge which opened in 1940 at 219 South Mill Street. He also gave 80 acres of rental land to finance building upkeep and to hire a matron attendant. 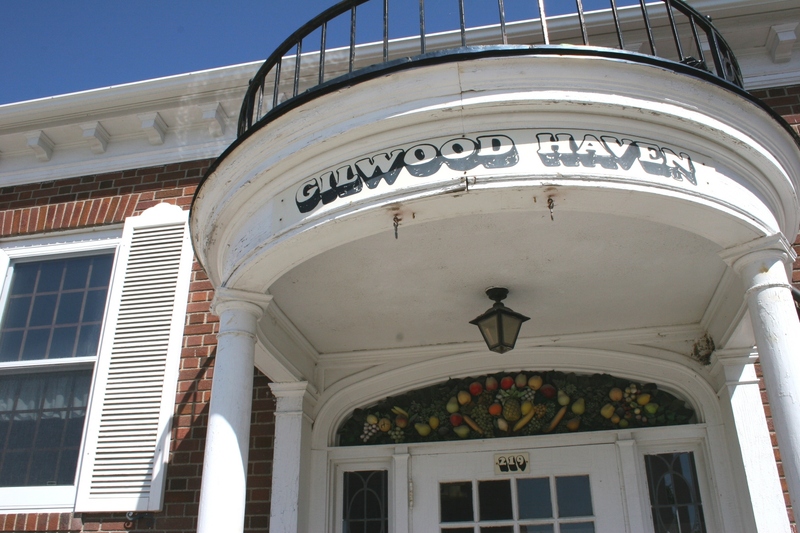 An exterior plaque on Gilwood Haven honors C. O. 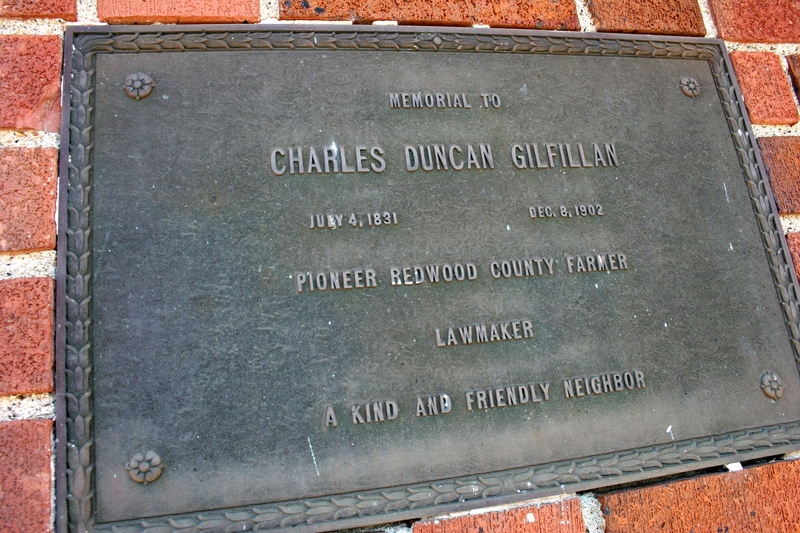 's father, Charles Duncan Gilfillan, a pioneer farmer. So there I was on a recent week day afternoon, longing to get inside the locked building. Not that I needed to use the restroom, I just needed to view this place of childhood memories. But that wasn’t going to happen. This haven now serves as a meeting place rather than a public facility. I had to settle instead for snapping photos of the exterior and wondering whether the fruit above the entry door is original to the building. And if it is, why didn’t I remember the apples, bananas, grapes, pineapple and pears? Has this fruit, which looks like plastic, always been above the doorway entry? And, if so, why fruit?